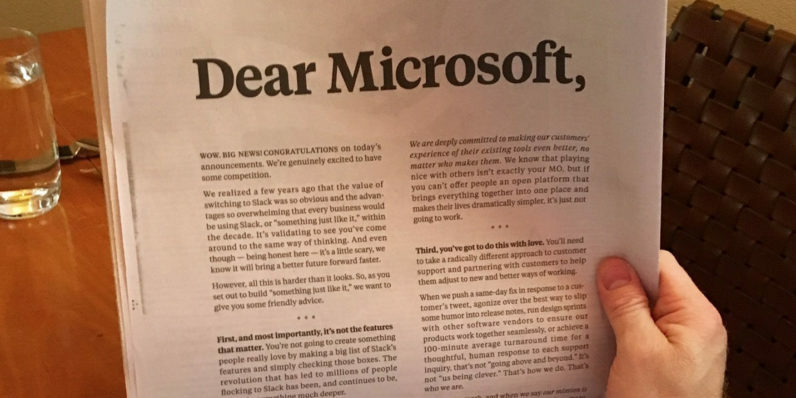 Ahead of the launch of Microsoft’s Teams chat and collaboration app, Slack took out a full-page ad in The New York Times to post an open letter, ‘welcoming’ Microsoft to the revolution and sharing some ‘friendly advice’. Unfortunately, the move that appears to have been an attempt to show that Slack is unafraid of a new major rival only served to expose just how scared it is. The company has shared the full text online as well. In its letter, Slack said, “It’s not the features that matter,” and went on to explain how copying every single one of its app’s features won’t cut it for Microsoft. That almost sounds like Slack didn’t see Microsoft coming. Teams seems like an obvious step forward for the company, which has been working to enhance its roster of cloud-based productivity tools over the past couple of years; the challenge here isn’t to mimic features well, but to push Microsoft’s productivity offerings further as best as possible. While Teams will definitely compete with Slack in the enterprise space, there are a lot of things that Microsoft is doing differently. For starters, Teams isn’t free; only companies that are subscribed to the Office 365 suite can get their hands on it. It’s also tightly integrated with Office apps, Skype, SharePoint and other Microsoft products. Having created a large ecosystem for teams to collaborate, it’s only natural that the company will want to offer a way to tie those services together with a group chat platform. Next, Slack said that “an open platform is essential,” and pointed to its the 750 third-party apps in its directory that integrate with its service. Slack is right, but it neglected to mention that its own platform isn’t open. The company controls which apps get in, and it could shut any of them out whenever it chooses. It isn’t clear why this seemed like a great point to include in the letter; all it does is highlight the fact that making money off software services is hard, and Microsoft already knows that. While it’s true that Microsoft is concerned about proprietary products, it’s also worth noting that the company has the highest number of open source contributors on GitHub projects, ahead of Google, Docker and Facebook. That’s not directly connected with Teams, but Slack’s statement shows a lack of understanding or acknowledgement of how Microsoft has changed its approach to the industry in recent years – particularly since Satya Nadella took over as CEO in 2014. Slack is clearly built with care and attention to detail, so much so that it truly is more delightful to use than a lot of other apps in my workflow (and that includes Microsoft products). But that isn’t easy to pull off – not even for Slack. The company has been slacking on delivering an oft-requested feature for nearly two years: threaded messages (Teams has that, by the way). Plus, its mobile app and Windows desktop app are both slow and feel clunky to use. This isn’t to say that Slack is in trouble. It’s built a stellar product and an admirable brand; it’s made our work at TNW a lot easier and we definitely have a lot of love for it. But it’s hard to interpret this open letter as anything but a sign of fear. It’s also odd that Slack didn’t seem as shaken up when Facebook launched its Workplace collaboration platform last month. That service has a lot going for it too: It looks and works just like Facebook so people don’t really need to train a lot to use it; it can be deployed to organizations of any size, and it offers competitive pricing. Stop worrying and wasting money on (ugh) print ads; you just do you and we’ll all be golden.